« Management issues in acute pulmonary embolism : Should heparin be started only after thrombolysis ? Aortic regurgitation complicating VDS is an important clinical entity in congenital heart disease.It is also a popular case for the cardiology fellows in their final clinical examinations . 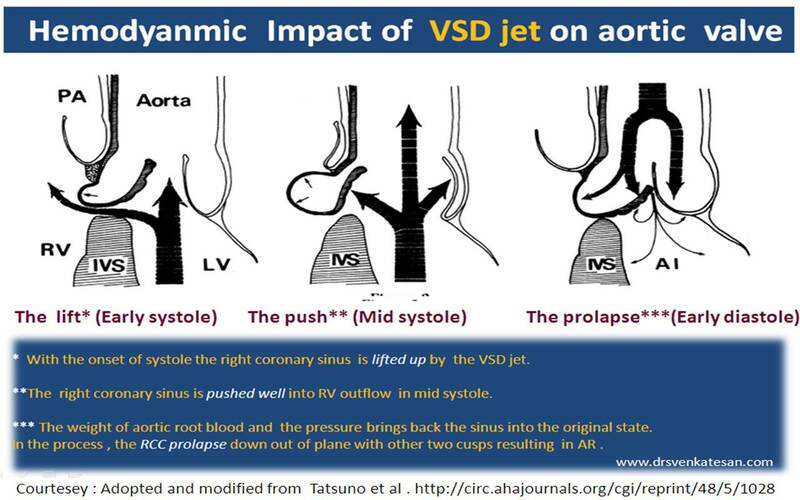 AR is a late manifestation of VSD (usually in early adolescent or adult hood) .This develops due to loss of aortic valvular support provided by the inter ventricular septum. It is differentiated from continuous murmur by a distinct reduction in the intensity of murmur towards the end systole and a different murmur appear in diastole . While , a continuous murmur is a single murmur that peaks around sound heart sound , overlaps the second heart sound and spills well into diastole. Hence,progressive pulmonary arterial hypertension is uncommon and Eisenmenger is reaction is very rare in VSD with AR. If AR is moderate , repair of aortic valve is considered along with VSD closure. For severe AR , Aortic valve replacement or repair with VSD closure mandatory. Device closure of VSD and percutaneous aortic valve replacement not feasible at the moment .May be a future possibility. * If both VSD and AR are very small , simple follow up , and observation (Leaving the patient happy!) could be a distinct option ! Thanks to circulation .Such articles are made available .